WoolfLibrary is a Legacy Library. Legacy libraries are the personal libraries of famous readers, entered by LibraryThing members from the Legacy Libraries group. » Leonard and Virginia Woolf's catalog. » Leonard and Virginia Woolf's legacy profile. WoolfLibrary is also an author. » See Leonard Woolf's author page. 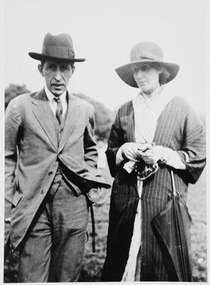 About meLeonard Woolf (25 November 1880 – 14 August 1969) and Virginia Woolf (25 January 1882 – 28 March 1941) are considered to be two of the greatest literary minds of twentieth century England. Both were founding members of the prominent Bloomsbury Group, and through Virginia's modernist writing, Leonard's editorial and political enterprise and their joint publishing venture, The Hogarth Press, they influenced artists, philosophers, and writers such as E.M. Forster, T.S. Eliot and H.G. Wells. The library of Monk's House, Rodmell also contained several albums of photographs which were donated to the Harvard Theatre Collection, Houghton Library at Harvard University by Frederick R. Koch. The collection was digitized in 2011. Sources: With thanks to the librarians and archivists of both institutions, the personal library of Leonard and Virginia Woolf was reproduced from records of extant copies held in the special collections of the Washington State University, and the Harry Ransom Center at the University of Texas. The collection held by the Washington State University was initially formed with the acquisition of the library at Monk's House, following the death of Leonard Woolf in 1969. This was later enlarged with the acquisition of the books which were inherrited by Trekkier Parsons, the purchase of books sold to Cecil Woolf, and purchases from private book collectors in England. In total, six acquisitions were made to complete the library.